FILE - President Donald Trump talks with Kim Yong Chol, left, former North Korean military intelligence chief and one of leader Kim Jong Un's closest aides, as they walk from the Oval Office at the White House in Washington, June 1, 2018. 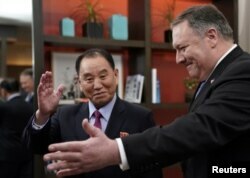 U.S. Secretary of State Mike Pompeo escorts Kim Yong Chol, North Korea's lead negotiator in nuclear diplomacy with the United States, into talks at a hotel in Washington, Jan. 18, 2019. FILE - U.S. President Donald Trump shakes hands with North Korea leader Kim Jong Un at the Capella resort on Sentosa Island, Singapore, June 12, 2018. 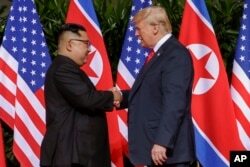 "We believe it's high time to make sure the negotiations between the United States and the Democratic People's Republic of Korea start again seriously and that a road map is clearly defined for the denuclearization of the Korean Peninsula," Guterres told reporters. "We won't advocate for any anticipation of other measures before a clear negotiation is put in place, aiming at denuclearization of the Korean Peninsula with a road map."